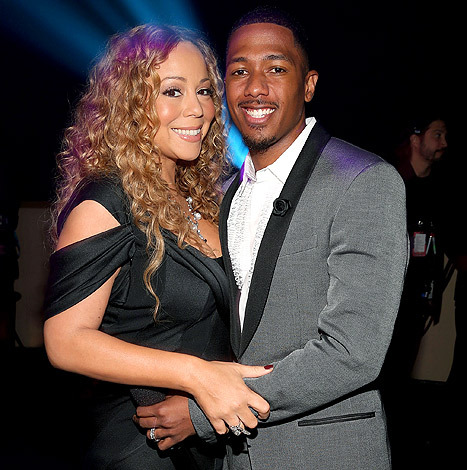 Nick Cannon says Mariah Carey's injuries on set of the video for "Beautiful" were "pretty serious"
The 43-year-old singer was rushed to hospital after taking a tumble on Sunday (07.07.13) while shooting the music video for her new remix single '#Beautiful' with Jeezy, which is being directed by her husband, 32, who said she acted like a "trooper", despite dislocating her shoulder and cracking one of her ribs. He told the 'Today Show' on Tuesday: "She's such a trooper. I was going to rush to the hospital with her, [but she said,] 'You get back in there and finish that video!' Then, after they put [her] shoulder back in place, bandaged her all up, she came back to the video early in the morning and finished out everything." Nick also revealed that Mariah's injuries were more serious than initially suspected. He explained: "She was in this nice, beautiful gown, heels on and everything, and was kind of on this platform and reached and slipped and fell on her whole side. It was pretty serious. Not only did she dislocate her shoulder, she actually cracked a rib and . . . she chipped her shoulder bone." Despite the injuries, Mariah is still expected to perform at the Hurricane Sandy benefit concert in Central Park's Great Lawn on July 13. A source said: "She will perform, but it is likely she will have her arm in a sling."